News, Articles, Press Releases Roofing Contractor - SMART Roofing Inc: Roof Repair, Installation, Hail Damage, Hail Storm Damage. Did you know that the roofing professionals at SMART Roofing, Inc. are certified as a Ludowici factory-trained Crown Roofer? 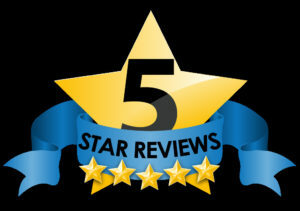 SMART Roofing, Inc. staff are dedicated to quality and craftsmanship in all types of roof repair and roof replacement. 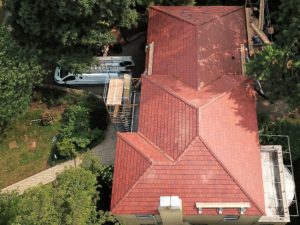 This River Forest – Riverside tile roof repair features the classic Ludowici clay tile, which is some of the finest architectural terra cotta roof tile products in the world. For this River Forest – Riverside tile roof repair, SMART Roofing, Inc. removed the existing Ludowici Classic tiles and replaced deteriorated felt underlayment with new synthetic Titanium PSU-30 ice and water shield. 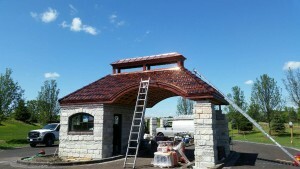 Then, the same Ludowici clay roof tile was reinstalled. This River Forest – Riverside roof repair also included all new hips and ridges, and new copper valleys. Since 1888, homeowners, commercial and government clients have turned to Ludowici for uniquely beautiful terra cotta roof tile products that stand the test of time. Although this roof tile is 80 years old, these River Forest – Riverside homeowners will now enjoy many more years of useful life from their clay tile roof. 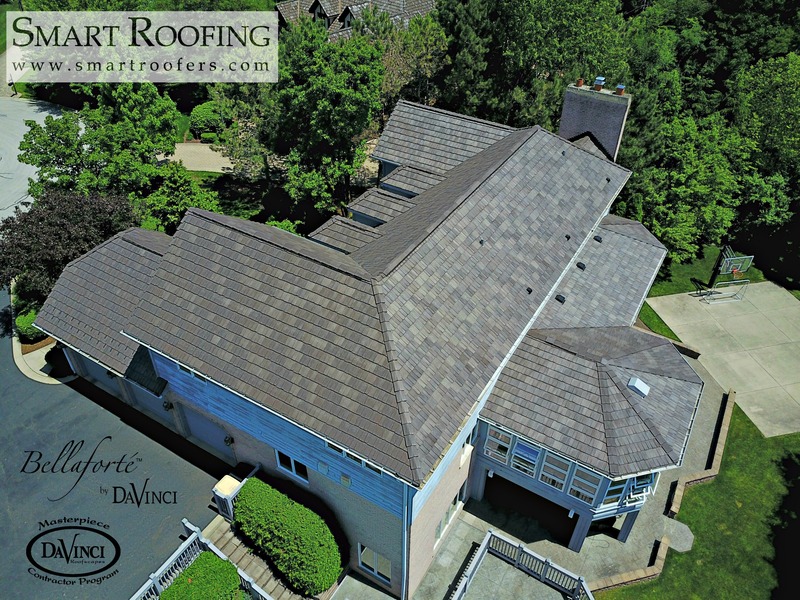 Clay tile and slate roofs are just a few of the many products that SMART Roofing, Inc. has installed in River Forest, Riverside, and throughout the Chicago suburbs. SMART Roofing, Inc. is a full service roofing contractor serving Chicago and its surrounding suburbs. 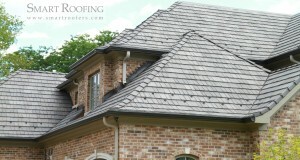 Select SMART Roofing, Inc. as your River Forest and Riverside Roofing Contractor. 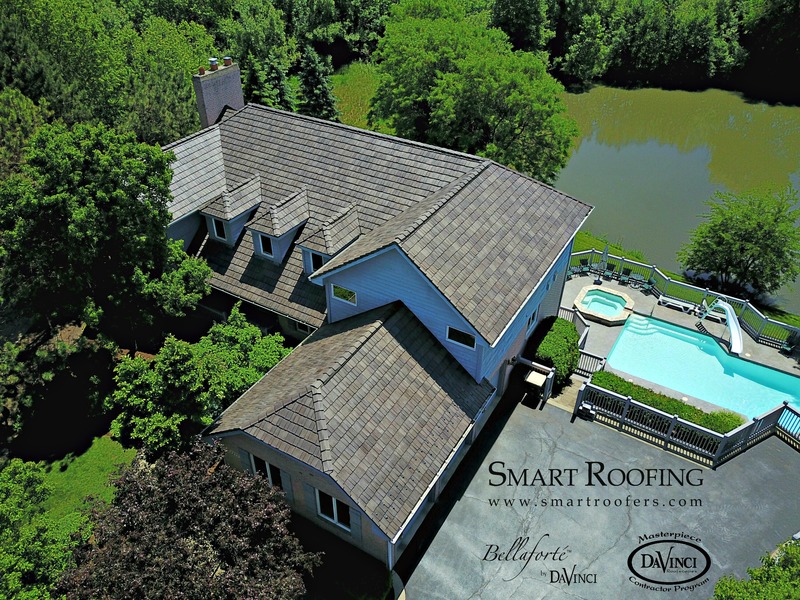 From roof assessments and repairs to installations of virtually every type of new residential roof and commercial roof, our commitment to excellence, stellar customer service and exceptional results are the “SMART” roofing difference. Contact the roofing experts at SMART Roofing, Inc. at (847) 797-0404, to learn more about Ludowici Roof Tile products, or email us for your residential or commercial roofing needs. Snow, rain, and frigid temperatures can’t slow down the roofing professionals at SMART Roofing, Inc. 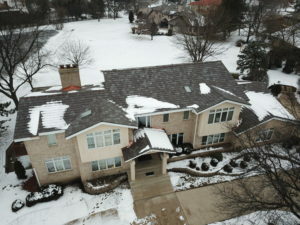 This tile roof replacement in Oak Brook was recently completed – yes, during this challenging Chicago winter! Although warmer seasons are typically popular times to think about roofing service, roof repairs, or roofing maintenance, waiting could possibly worsen existing problems. 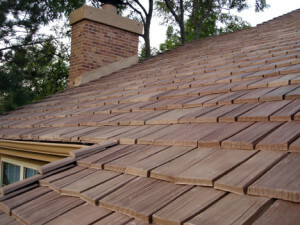 SMART Roofing, Inc. provides roof service, roof maintenance, and roof installation year-round! Smart Roofing Inc. replaced the old concrete tile roof of this Oak Brook residence with Ludowici clay roof tiles, LudoSlate. 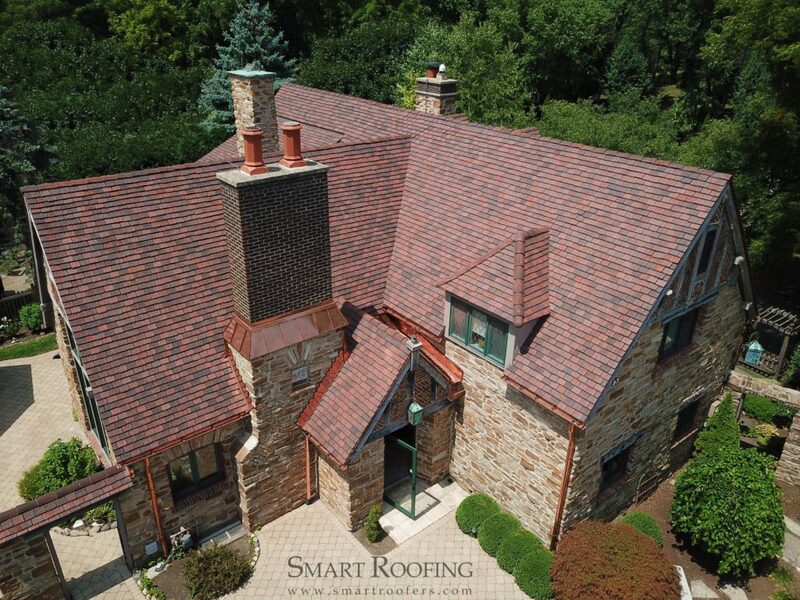 Ludowici’s LudoSlate interlocking clay tile is covered by a 75-year material warranty, and is one of the many products that SMART Roofing, Inc. has installed in Oak Brook, and throughout the Chicago suburbs. 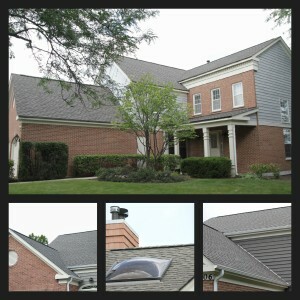 SMART Roofing, Inc. also installed six new Velux skylights featuring solar powered blinds. 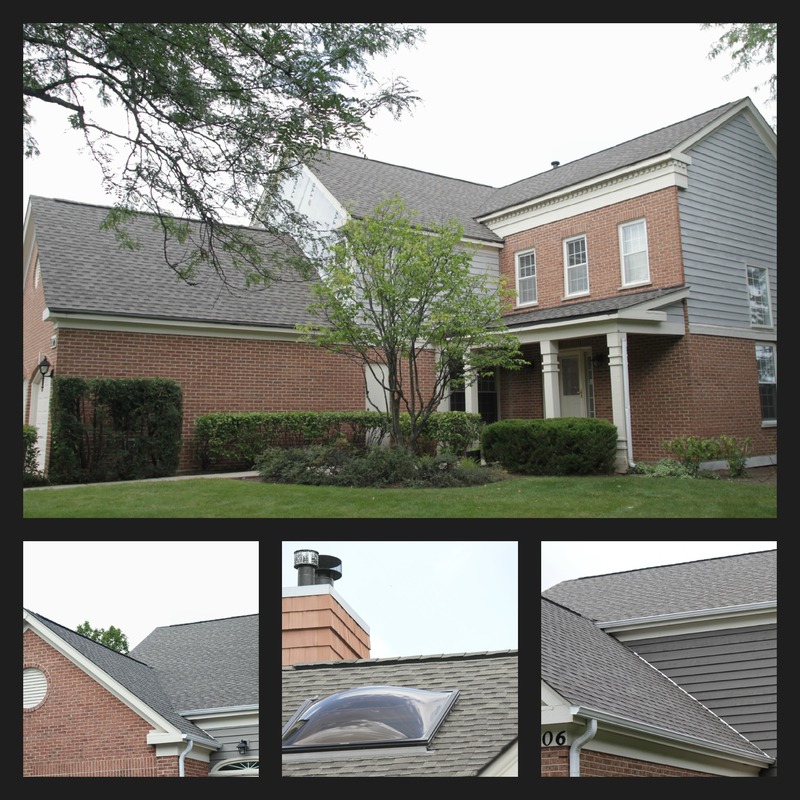 These Oak Brook homeowners will now be able to control the amount of lighting coming through the Velux skylights by using a battery-powered remote control, which is charged by the sun. SMART Roofing, Inc. is a full service roofing contractor serving Chicago and its surrounding suburbs. 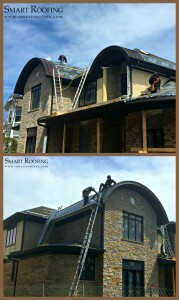 Select SMART Roofing, Inc. as your Oak Brook Roofing Contractor. From roof assessments and repairs to installations of virtually every type of new residential roof and commercial roof, our commitment to excellence, stellar customer service and exceptional results are the “SMART” roofing difference. Contact the roofing experts at SMART Roofing, Inc. at (847) 797-0404, to learn more about Ludowici Roof Tile products, or email us for your residential or commercial roofing needs. 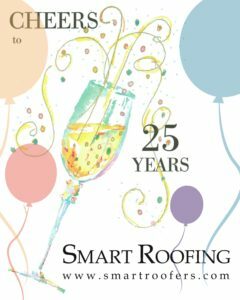 SMART Roofing, Inc. is proud to celebrate 25 years in business as Chicago’s “SMART” roofing contractor. 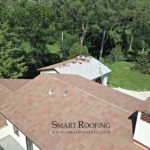 SMART Roofing, Inc. started in September of 1993 when Richard Bondarowicz and Stan Miodowski saw an opportunity to put their knowledge of the roofing industry and their strong work ethic into forming what has now become of Chicago’s most respected roofing companies. Today, SMART Roofing, Inc. is a recognized leader in Chicago’s competitive residential and commercial roofing market. Along with over 10,000 customers, SMART contributes its success to the strength of the long-term partnerships with trusted suppliers and employees, as well as their dedication to quality. The relationships SMART Roofing, Inc. has built – and will continue to build – with each of our customers and business partners, will always be our number one motivator for success. As we celebrate, we’d like to say THANK YOU to all of our customers, employees, and business partners, both past and present. Cheers to the next 25 years! 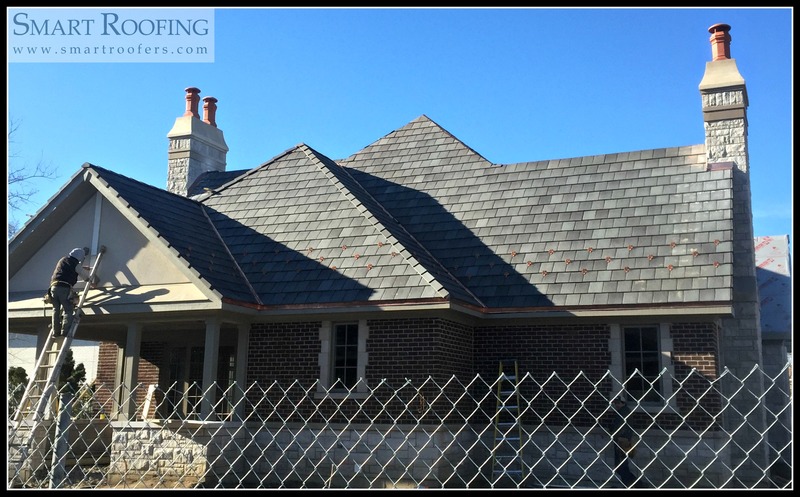 The roofing professionals at SMART Roofing recently completed the installation of this LudoShake Premier terra cotta roof tile. This lightweight interlocking terra cotta roof tile features the texture and varied thickness of hand split wood; however, unlike wood, rubber or plastic shakes, LudoShake clay tiles are Class A fire resistant, maintenance-free, and are covered by a 75-year warranty. The roof system also includes IB Roof Systems PVC membrane, and Interwrap Titanium PSU-30 ice and water shield. These products provide superior protection from wind-driven rain, water, snow and ice dams. 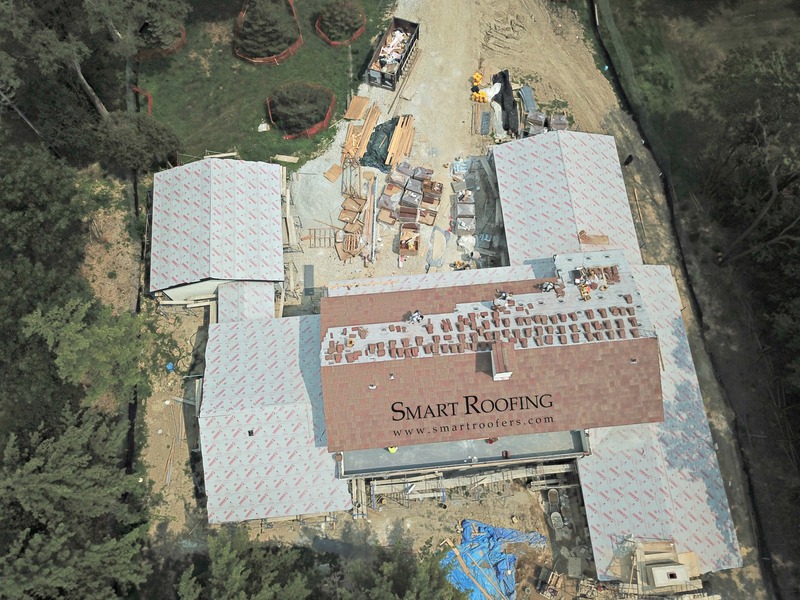 SMART Roofing, Inc. is a full service roofing contractor serving Chicago and its surrounding suburbs. From roof assessments and repairs to installations of virtually every type of new residential roof and commercial roof, our commitment to excellence, stellar customer service and exceptional results are the “SMART” roofing difference. Contact the roofing experts at SMART Roofing, Inc.at (847) 797-0404, to learn more about Ludowici Roof Tile products, or email us at contactus@smartroofers.com for your residential or commercial roofing needs. The roofing professionals at SMART Roofing, Inc. recently replaced the hail-damaged tile roof of this Schaumburg home with Ludowici Brittany clay shingle roof tiles. Ludowici Roof Tiles have a long-trusted reputation for exceptionally beautiful architectural terra cotta that lasts for centuries. The Brittany shingle roof tile is a dramatic textured terra cotta tile in irregular lengths with the feel of aged stone. Unlike other roofing materials, Ludowici terra cotta tiles have a life expectancy of over 100 years. In addition, the Titanium PSU-30 ice shield roofing underlayment installed by SMART Roofing, Inc. will provide protection from wind-driven rain, water, snow, and ice dams that come with Chicago weather. 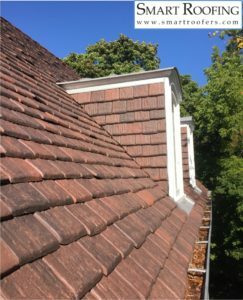 To further enhance the old world artisan craftsmanship of this spectacular clay tile roof, ornamental copper work by Chicago Metal Supply was installed by SMART Roofing, Inc. 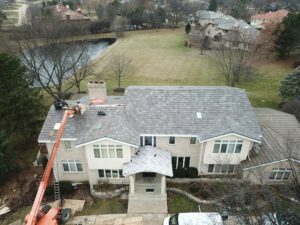 The roofing experts at Smart Roofing Inc. have recently recovered an aged modified bitumen roof on a multi-family building in Arlington Heights, Illinois for a fraction of the cost of a regular roof replacement, while providing an additional long-lasting, waterproof roofing layer. It was done using Andek Polaroof RAC Urethane liquid membrane. Andek Polaroof RAC is tough and elastic with a high tensile strength and good puncture resistance and contains corrosion-inhibiting pigments for protection against rust and acid rain. The membrane goes over properly cleaned, existing roofing with extra attention to detail around problem areas such as seams, low spots, or changes of slope. Andek Polaroof RAC is applied seamlessly, eliminating the need to worry about old seams separating and allowing water in. Andek is also a reflective layer, meaning it does not get hot with the sun exposure, lowering your cooling bills. It withstands all weather conditions, from freezing winter nights to hot summer afternoons, typical Chicago weather, and comes with a 10-year warranty! Andek Polaroof RAC membrane is a great choice for commercial and residential building owners where a complete roof replacement might not be possible or cost prohibitive. Polaroof RAC, being a relatively affordable option, offers an amazing quality and look, and provides a superb waterproofing option for aging roofs. If you are thinking of having your roof repaired or replaced, contact the roofing experts at Smart Roofing, Inc.at (847) 797-0404, to learn more about our roof products and services, or email us at contactus@smartroofers.com for your other residential or commercial roofing needs. 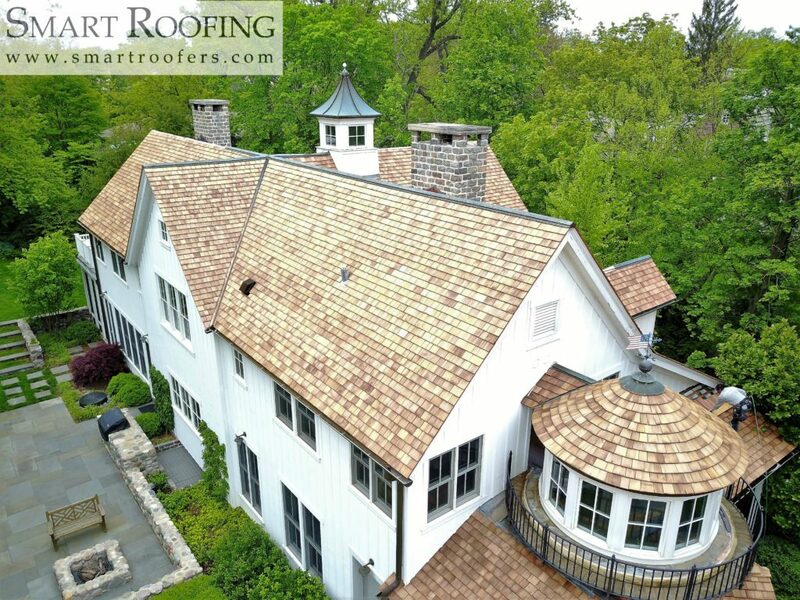 The roofing professionals at Smart Roofing, Inc. recently installed this beautiful Western Red Cedar Tapersawn Shake roof in Lake Forest. Western Red Cedar Tapersawn Shakes are sawn on both sides giving it a look similar to a sawn shingle but with a thicker appearance, Tapersawn Shakes are known for their smooth uniform imposing look providing an exceptional looking roof. Contact Smart Roofing, Inc. at (847) 797-0404, or email us at contactus@smartroofers.com for your ALL of your residential or commercial roofing needs. If you are ready for a new roof or gutters, contact Smart Roofing, Inc. at (847) 797-0404, or email us at contactus@smartroofers.com for your ALL of your residential or commercial roofing needs. It may be the most wonderful time of the year, but installing festive lights on a home can be a headache and potentially cause damage to your roof. Avoid the hassle and make decorating more enjoyable with these tips to avoid roof damage. Happy Holidays from Smart Roofing, Inc.! Smart Roofing, Inc., a Ludowici Crown Roofer, recently replaced the 90-year-old Ludowici Brittany shingle clay tile roof on this Lake Forest home. A dramatic textured terra cotta tile in irregular lengths with the feel of aged stone, Brittany shingle roof tile provides a truly provincial appearance. Brittany shingle tiles are available in standard and custom matte colors, mists and blends. Contact the roofing experts at Smart Roofing, Inc.at (847) 797-0404, to learn more about Ludowici Roof Tile products, or email us at contactus@smartroofers.com for your other residential or commercial roofing needs. Ick. MOLD. That four-letter word can cause any homeowner to tremble. Did you know that September is Mold Awareness Month? Overall, mold likes to grow where it’s damp. That’s why you will sometimes see it accumulate on bathroom walls and showers, in closed-in attic spaces, and sometimes on roofs! The best way to prevent the mold in these areas is with proper ventilation. So, adding ventilating louvers to your attic is just as important as running an exhaust fan when taking a shower. You should also make sure to add a continuous ridge vent at the top of your roof – especially in steep slope roofing situations. Another option to prevent mold from growing on your roof is to make sure to research the roofing material you select for your home. The quality line of synthetic roofing tiles from DaVinci Roofscapes are manufactured to resist these elements of nature — plus insects, decay and rot. 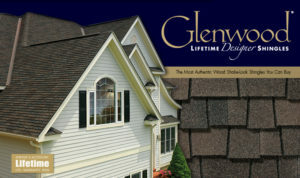 Thanks to their proprietary manufacturing techniques and the lifetime warranty on DaVinci plastic roofing materials, you’ll never say “ick” when looking at your beautiful roof. The roofing professionals at Smart Roofing, Inc. are certified DaVinci Masterpiece Roofing Contractors who have the expertise and experience to assist you with all of your roofing needs – moldy or not! 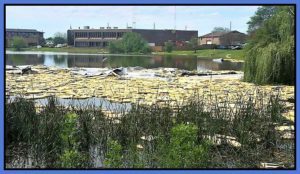 If you have, or suspect that you have, a mold problem with your residential or commercial roof, Smart Roofing, Inc. at 847.797.0404 or or email contactus@smartroofers.com! The roofing experts at Smart Roofing, Inc. have recently installed a standing seam metal roof system in Highland Park, Illinois. A standing seam metal roof system is a succession of vertical sheet metal panels connected side-by-side by a vertical locking mechanism called the seam. The seams can be seen from the ridge of a roof all the way down to the eaves. The locked seam is raised by an inch or two above the panels in order to maintain water-tightness of the system. The raised seam also provides for a unique and distinctive appearance. From my very first conversation with you, to the last standing seam panel your expert crew installed, my experience with Smart Roofing was, in a word, fantastic. Smart Roofing’s attention to detail and care for my home was evident in every member of your crew, right down to the impeccable cleanup. Everyone was courteous, not only to me, but to each other, and answered each of my 10,125 questions and dealt with all my concerns as if they were working on their own home. Their craftsmanship is evident in even the smallest details, which I especially appreciate. As you promised, the new roof is well·engineered, because my house is cooler on these hot summer days. And, as you also promised, it is aesthetically beautiful, as evidenced by the many compliments I’ve received. Thank you for truly improving my home- and for fulfilling my dream of at last having a standing seam roof. Traditional (non-metal made) tiles are available in concrete or clay, and come in a multitude of shapes, profiles and colors. What’s The Difference in Cost Between Concrete and Clay Tiles? With all of the reasons mentioned above, it should come as no surprise that clay tiles cost about 30% more than concrete tiles. 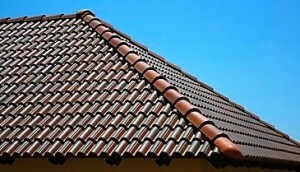 The average cost of clay tiles is $10 to $15 per square foot, installed. Since both clay and concrete tiles are expensive in comparison to most other roofing choices, you should consider whether all the added benefits that real tiles have to offer are worth the extra expense. The total life-cycle cost of tiles is actually quite low compared to composition shingles, since clay tiles can last for as long as 100 years, while concrete tiles should protect your roof for 50 years plus. If unique style and authenticity is what you are looking for, then tiles can be a sound choice for your home, provided that you are also willing to invest in the structural reinforcement of your roof truss structure. Whether you are interested in tiles or asphalt shingles, cedar shingles, natural slate, or metal roofing, this calculator will instantly give you an estimate of the cost of a new roof, based on your home’s ground dimensions and the type of a roofing system you are interested in. Just input your roof’s basic measurements and slope, and let the calculator do the rest! Once you’ve made your decision, contact the experts at Smart Roofing, Inc. at 847.797.0404 or or email contactus@smartroofers.com to install your new roof! A 105% return! This home improvement project really pays off the most! The National Association of Realtors and the National Association of the Remolding Industry recently came out with the “Remodeling Impact Report,” which surveyed contractors and Realtors, looked at cost spent and the impact on home values by project. Based on that data, CNBC came up with some tips on which projects homeowners might want to follow as they pursue their quest for the perfect home. When it comes to the outside of the home, buyers apparently value structural over decorative improvements to the interior. The No. 1 exterior renovation was a new roof, as nearly one-third of Realtors surveyed said that project helped close a sale on a home. Plus, this is a renovation that more than pays for itself. Getting a new roof may run about $7,600 on average, while the value you are able to recover from doing this project may be as much as $8,000. You can recoup as much as 105 percent of your investment! Spring storms come fast in the Midwest. 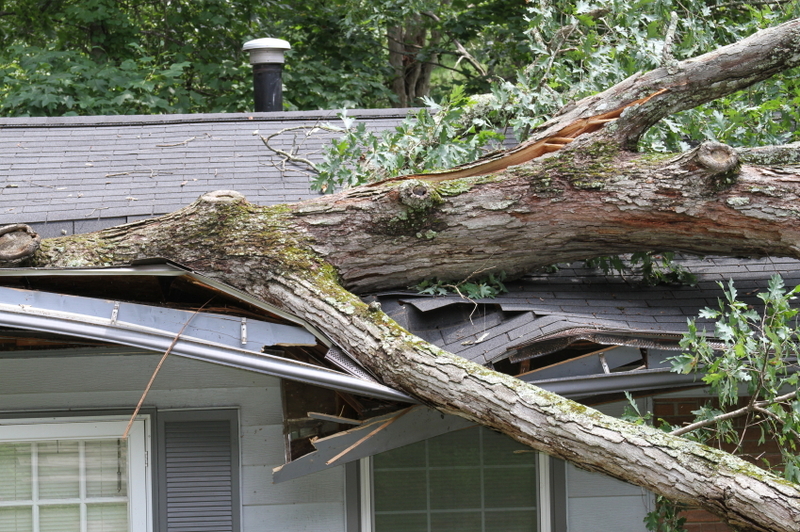 As we know, those spring storms bring windy weather which can damage your roof. Spring is the perfect time to consider a composite shake roofing tile with proven wind resistance. Bellaforté Shake polymer roofing tiles feature a leading edge tab that secures every tile to drastically improve wind performance. The composite shake tiles have passed the ASTM D 3161 test for 110 mph wind resistance, along with the UL 2218 testing for Class 4 impact resistance. 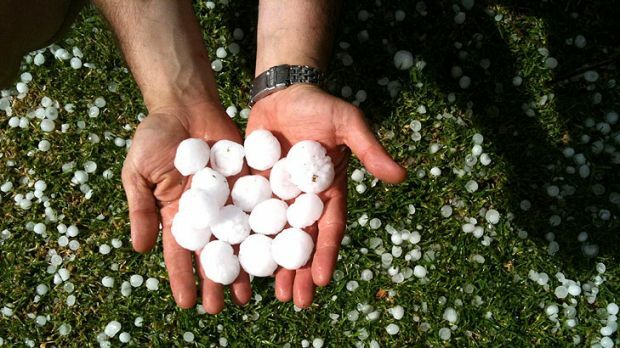 Identifying whether your roof, siding or windows have sustained damage from a hail storm may be difficult. The experts at SMART Roofing, Inc. can help! Also, many insurance companies will consider paying for storm or hail damage. 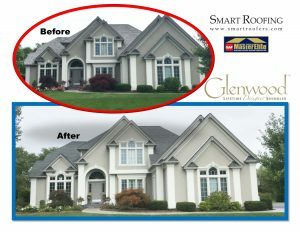 SMART Roofing, Inc. has helped thousands of customers in the Chicago suburbs navigate the insurance roof claim process. 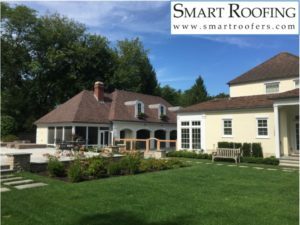 Call us at 847.797.0404 or email contactus@smartroofers.com today! Chicago Hail Storm Damage – Hail from a 1/2-inch to 1 inch fell as the storm passed through Elgin, Arlington Heights and other northwest suburbs, according to the weather service. A second line of storms hit suburbs including Arlington Heights and points east to near Lake Bluff. According to the National Weather Service, there were damaging winds in excess of 60 mph. 1.00 INCH IN LINCOLN PARK. .75 INCH IN LAKEVIEW SECTION OF CHICAGO. 1.00 INCH NEAR IRVING PARK AND PULASKI. .88 INCH IN WOOD DALE. 1.25 INCH IN VERNON HILLS. .50 INCH IN MOUNT PROSPECT. .50 INCH IN ARLINGTON HEIGHTS. .88 INCH IN ELK GROVE VILLAGE. .88 INCH IN CRYSTAL LAKE. 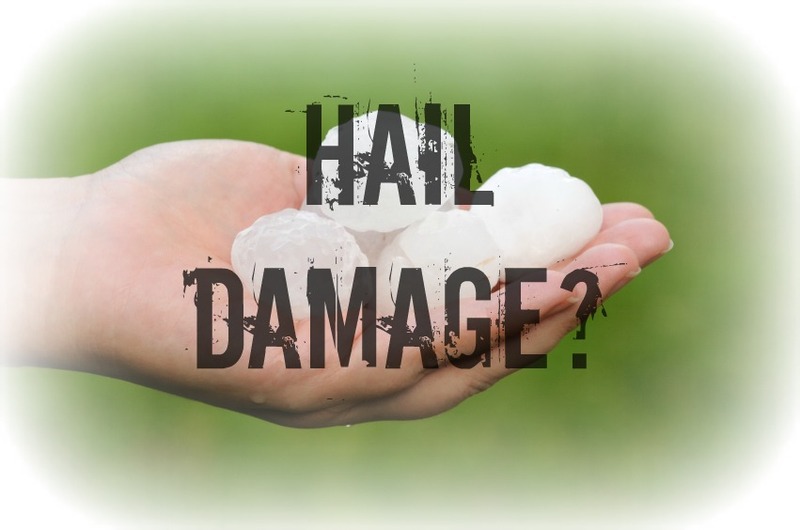 If you have or suspect you have hail damage to your home or commercial building, contact the roofing hail damage experts at Smart Roofing, Inc. at (847) 797-0404, or email us at contactus@smartroofers.com. Not Just Metal, But Standing Seam – There’s metal roofing, and then there’s a particular type called standing seam metal roofing. 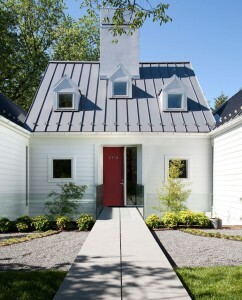 Houses in your neighborhood with metal roofs most likely are of the standing seam variety. Continuous panels run from the ridge of the roof all the way down to the eaves. Between the panels are seams connected by fasteners which are raised above the level of the metal roofing. This is where we get the term standing seam, because the seam is raised or standing, as opposed to flush-mounted. Smart Roofing, Inc. is proud to announce it’s certification as a Ludowici Roof Tile Crown Roofer. A quality roof system is no accident. It takes quality products and expert installation to protect your property against the elements for years. Since 1888 Ludowici has been protecting buildings large and small. Clay tile roofs have been the preferred choice of discerning architects, designers and owners for centuries because of the natural warmth and permanent beauty of clay. Ludowici’s clay roof tiles provide 126 years of proven ability, limitless product offerings and the Industry’s best warranty. The Ludowici Crown Roofer training program requires partner roofing contractors to learn the company’s wide selection of roofing tiles, trim fittings, underlayment and fasteners, and train in how to work and detail each one. This detailed hands-on training includes measuring, layout, cutting, notching and roof tile replacement. It’s a process that ensures that the high-quality Ludowici clay roof tiles are installed according to the highest standards. Equipped with time-tested know-how, factory-trained Ludowici Crown Roofers like Smart Roofing, Inc. are roofing contractors who use the best roofing components and materials available. ABC 7/CHICAGO (WLS) — The Chicago area is in for a windy Wednesday. Sustained winds of at least 40 mph are expected in most of the area during the day, with potential for wind gusts greater than 55 mph, ABC7 Meteorologist Tracy Butler said. A High Wind Warning will be in effect for Cook, DuPage, Kane, DeKalb, McHenry and Lake counties in Illinois and all of southern Wisconsin from 7 a.m. to 8 p.m. Wednesday, the National Weather Service said. A High Wind Advisory will be in effect for counties along I-80 and south of I-80 during the same time period. The weather service said the strong west winds could make travel difficult Wednesday, especially for high-profile vehicles on north-south roads. Property damage is also possible. If you have or suspect you have damage to your home or commercial building, contact the roofing experts at Smart Roofing, Inc. at (847) 797-0404, or email us at contactus@smartroofers.com. With near hurricane-force winds throughout Chicago and Chicago’s suburbs on Friday, many areas have reported shredded roofs, broken windows, and trees and fences which toppled over. In severe wind storms, it is common for shingles or sections of the roof to be missing altogether. On other types of roofs, including wood shake roofs, metal roofs, tile roofs and slate roofs, damage can include broken or cracked shingles, missing shingles, torn or split seams, and missing sections of the roof. 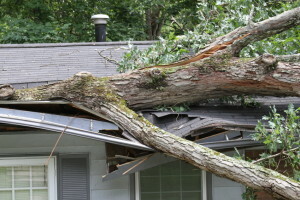 If a tree limb or other debris has fallen onto your roof during the storm, you may have structural damage, and will want to exercise extreme caution. If you have or suspect you have damage to your home or commercial building, Contact the roofing professionals at Smart Roofing, Inc. at (847) 797-0404, or email us at contactus@smartroofers.com. 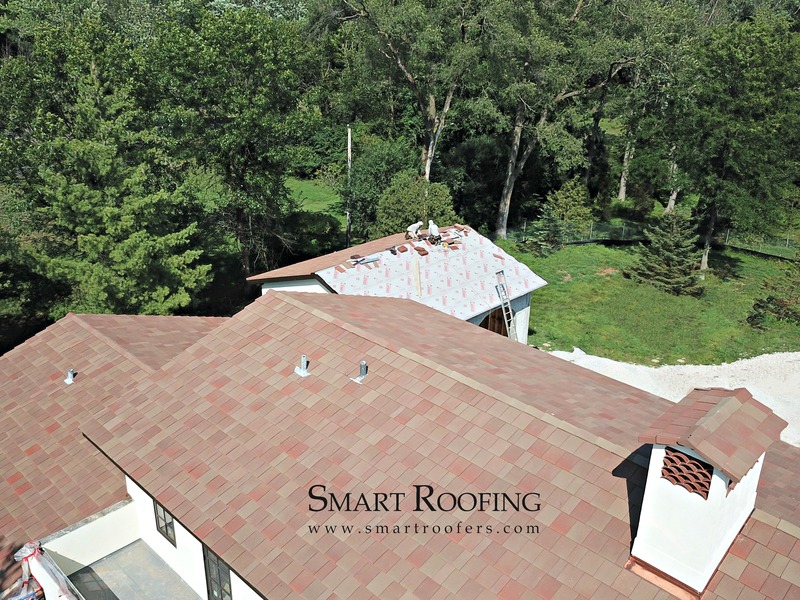 The roofing professionals at Smart Roofing, Inc. are completing another beautiful roofing project in the Chicago Northwest Suburbs using LudoSlate by Ludowici. L udoSlate interlocking tile has the texture and varied thickness of natural hand split slate and can be laid staggered for a more rustic look. The tile have a ceramic finish that comes in 11 standard colors as well as custom colors or blends and is warranted for 75 years in all climates. Unlike rubber or plastic slates, LudoSlate has 120 years of proven technology behind it, is Class A fire resistant and will never curl or fade. LudoSlate is lightweight, easy to install, maintenance free. for all your residential or commercial roofing needs. 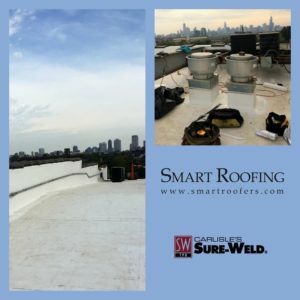 The roofing professionals at Smart Roofing, Inc. completed another beautiful roofing project in the Chicago Northwest Suburb of Glenview, Illinois. This new roof features GAF Timberline Architectural Shingles. GAF Timberline Architectural Shingles with advanced protection technology are the #1-selling shingles in all of North America. Choosing GAF Timberline Architectural Shingles will not only protect your most valuable asset – they’ll beautify your home for years to come. Contact the roofing professionals at Smart Roofing, Inc. at (847) 797-0404, or email us at contactus@smartroofers.com for your residential or commercial roofing needs. We all know that winter weather is coming soon. Extreme weather is the new normal, so it’s important to be sure that your home is constructed to withstand wind-driven rain, snow, ice and everything else Mother Nature brings. The good news is, if you understand how ice dams form and know about high-quality products and proper roof system installation methods, you can help protect your home from the damaging effects of ice dams. 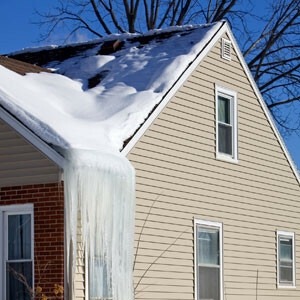 An ice dam begins to form when warmed air in an attic space causes snow on the roof to melt. The water flows down the slope of the roof toward the eave where it refreezes because the eave overhangs unheated space. As the process continues, ice builds up at the eave, forming a dam. Standing water becomes trapped behind the ice dam and can leak into the home or building at fastener penetrations, usually right over an exterior wall. Roof system designs should incorporate building materials such as underlayments that limit the formation of ice dams and help prevent leaks caused by ice dams. Underlayments protect roof systems by minimizing leaks caused by ice dams, but they do not prevent ice dams from forming. Roof assemblies designed with proper insulation and adequate ventilation will help limit the formation of ice dams by minimizing the heat transfer from the home’s or building’s interior to the air in the attic space. The combination of air sealing, insulation and ventilation is crucial. Contact the roofing professionals at Smart Roofing, Inc. at (847) 797-0404, or email us at contactus@smartroofers.com for your residential or commercial roofing needs before The Ice Dam Cometh. 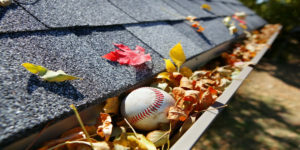 Fall is the time for roof maintenance, roof inspections and roof repairs. Before the cold, snowy weather returns, contact us to schedule maintenance and repairs to your roof. 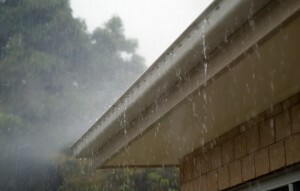 Gutters: Gutters are one of the most important parts of a home, and blocked gutters are a big source of leaks. If gutters are clogged with leaves, shingle granules, branches, and other debris, then water can’t funnel off the roof and away from the house. That can cause severe damage to the roof, walls, and gutters, and can be quite pricey to fix. 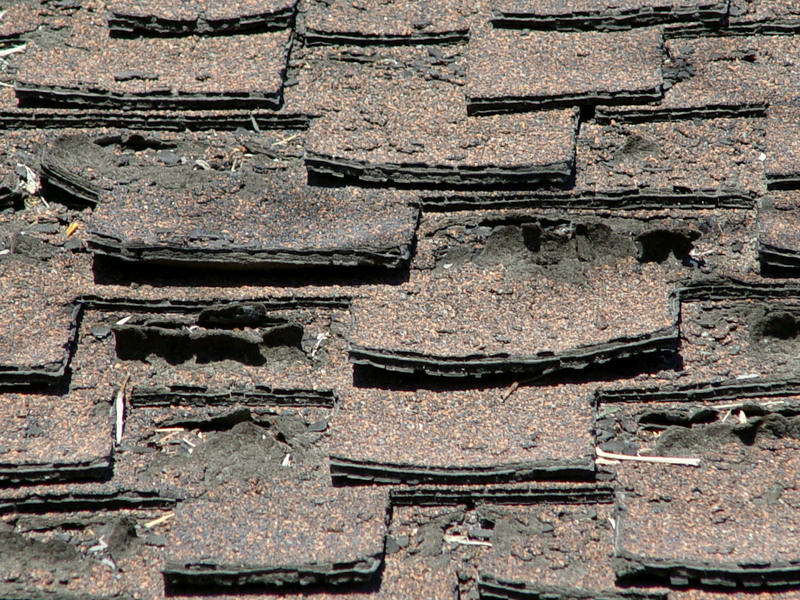 Shingles: An inspection will uncover any shingle tabs that have come loose or have broken, curled, or warped. 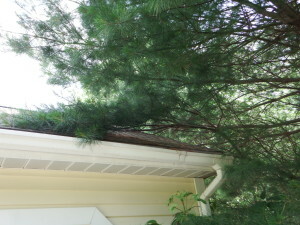 Another possibility is that a branch could’ve fallen on the roof and caused damage. These simple repairs will help avoid costly water issues down the road. Vents: Neoprene or rubber can crack with age, while critters can cause damage to any vented area on the roof. Resealing will fix these vent problems and help keep animals and water out. Flashings: Chimneys have three potential issues: flashing, siding, and the cap that can contribute to leaks. An inspection will ensure the area is properly flashed and sealed. 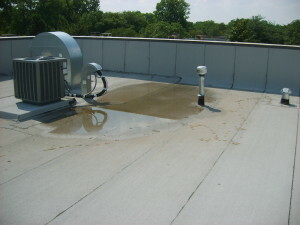 Flashing on skylights can easily get water trapped behind them as well. Attic: Many times it’s the attic that is the source of the problem rather than the roof. Issues such as improper ventilation, plumbing, air conditioning, fans, or animal or bug infestation can cause mold, algae, or moisture condensation in the attic space. Prevent roof damage and boost energy efficiency in your home before the cold weather hits Chicago. Smart Roofing, Inc. can help you with your home maintenance checklist. The Chicago area got soaked by heavy rain Thursday night and early Friday, with some suburbs getting more than 3 inches of rain. Identifying whether your roof, gutters, siding or windows have sustained damage from a storm may be difficult. The experts at SMART Roofing, Inc. can help! Call us at 847.797.0404 or email contactus@smartroofers.com today! 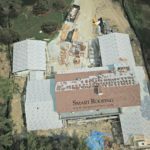 Smart Construction Group and Smart Roofing, Inc. – Your Local Insurance Restoration Experts! Contact SMART today at (847) 797-0404, or email us at contactus@smartgroupchicago.com for your insurance restoration needs. Summer is over, and the kids are back to school. Like you, we’re sad to see the longer days and warm sunshine fade away, but we want to help you get your roof ready for the Chicago winter ahead. Believe it or not, NOW is the time to schedule your roofing repairs or new roof replacement. 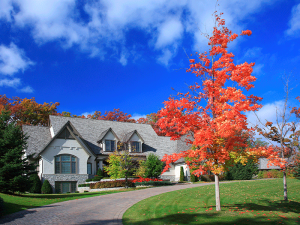 With the cooler temperatures, this is the perfect time of year for roof repairs and maintenance or a new roof. Contact Smart Roofing, Inc. today at (847) 797-0404, or email us at contactus@smartroofers.com for your residential or commercial roofing needs. Don’t trust your biggest asset to just any contractor. 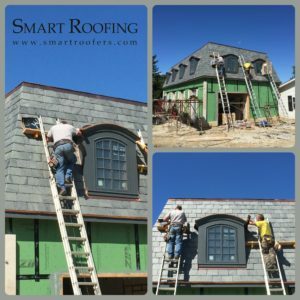 Smart Roofing is a GAF factory-certified Master Elite roofing contractor serving Chicago and the Chicago suburbs for over 20 years! Because of GAF’s stringent standards, only the top 2% of all roofing contractors have qualified as Master Elite contractors! Choosing a Master Elite contractor like Smart Roofing, Inc. is your assurance that you’ll be dealing with a quality, reputable, and dependable professional roofing contractor. Call us at (847) 797-0404. or email contactus@smartroofers.com. 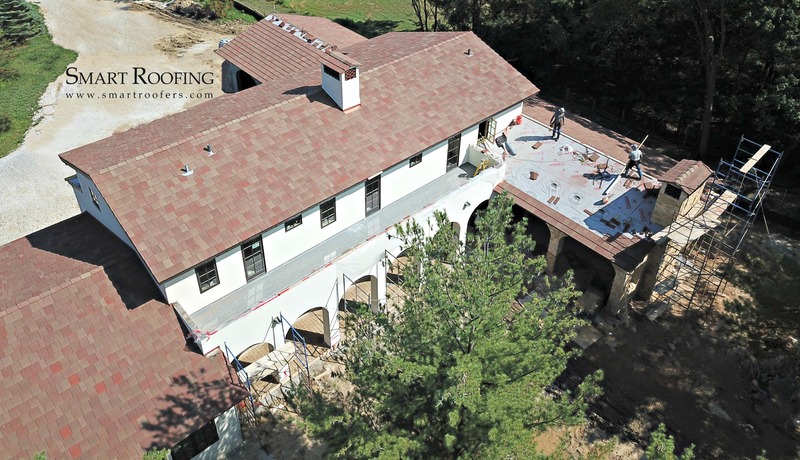 This new custom home in Glenview, Illinois is a current North Shore project of Smart Builders, Inc.
Smart Roofing, Inc. installs a premium grade Western Red Cedar Wood Shake roof in Chicago’s North Shore neighborhood of Glenview. These Western Red Cedar Tapersawn Wood Shakes were manufactured in British Columbia, and combine a traditional look with reliable performance. 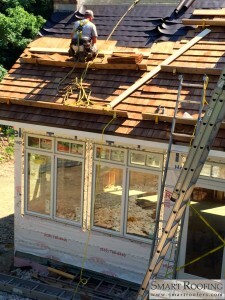 A cedar shake roof will be as durable as it is beautiful. Cedar’s natural versatility makes it the ideal choice for your roof. Contact SMART Roofing, Inc. today at 847.797.0404 for your commercial and residential roofing needs! 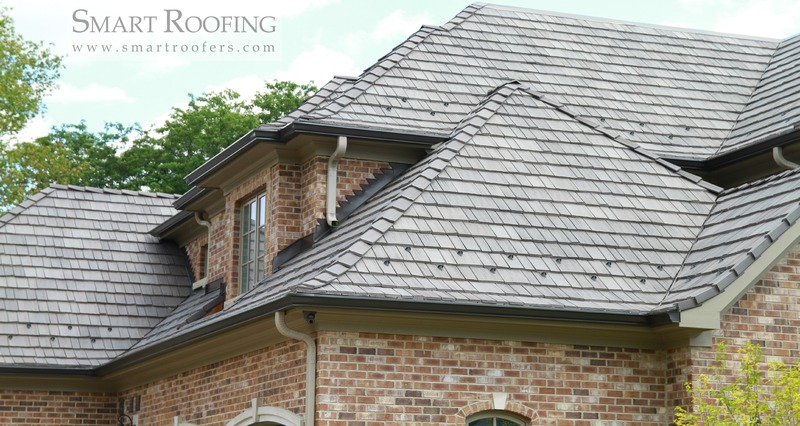 Residents of the Chicago suburbs are all too familiar with the type of damage that hail storms can cause, but when it comes to the roof hail damage, you may need to call a professional. Many homeowners make the mistake of only looking for damage in the form of missing shingles. 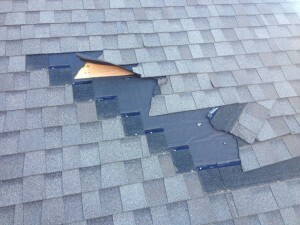 However, there could be damage underneath the shingles which can cause leaks to occur well after the storm has passed. If you are unsure of whether your roof or gutters have been damaged, look around at your landscaping to see if hail has blistered any nearby trees or shrubs. 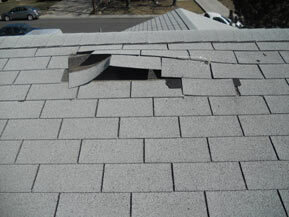 When hail is strong enough to do damage to these elements, chances are, you also have some sort of roof hail damage. 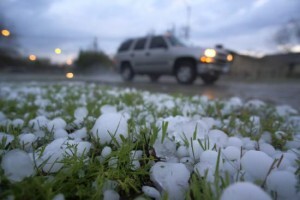 Golf ball-sized hail and 60-mph winds were recorded in the severe storm blast. 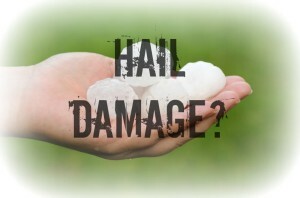 Identifying whether your roof, siding or windows have sustained damage from a hail storm may be difficult. The experts at SMART Roofing, Inc. can help! Also, many insurance companies will consider paying for storm or hail damage. 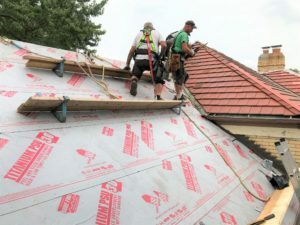 SMART Roofing, Inc. has helped thousands of customers in the Chicago suburbs navigate the insurance roof claim process. Call us at 847.797.0404 or email contactus@smartroofers.com today! Smart Roofing, Inc. recently installed a French Style Clay Tile and Standing Seam Copper Roof on the guard house for the Enclave Subdivision in South Barrington. There are four popular styles or patterns of clay and concrete roof tiles, These are: Mission Style; French Style; Interlocking Shingle Style; and Spanish Style. Large and durable, French Style tile has deep locks on all four sides. In addition, two prominent flutes on the surface of the clay tile allow for fast drainage. These flutes in the clay tile produce a shadow effect for a highly refined appearance. 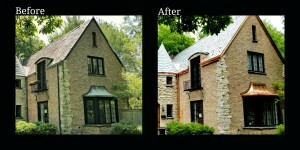 Smart Roofing, Inc. completes slate and copper roof on vintage Chicago North Shore residence. 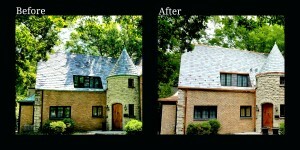 The existing 100 year-old slate roof on this home in Winnetka was replaced with a 3-color blend, graduated exposure, Evergreen slate. 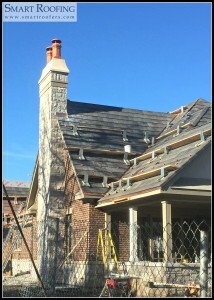 Installation of Hunter “cool vent” panels on the entire roof, new copper gutters & downspouts, and a custom soffit venting system was created to allow for proper air movement. The insulation panels and fascia vents will help the roof assembly breathe properly. The roof system installation is an example of modern roofing technology installed on a classic Chicago North Shore residence. 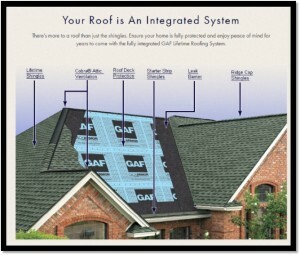 The roof system will allow for many decades of trouble free roof service. 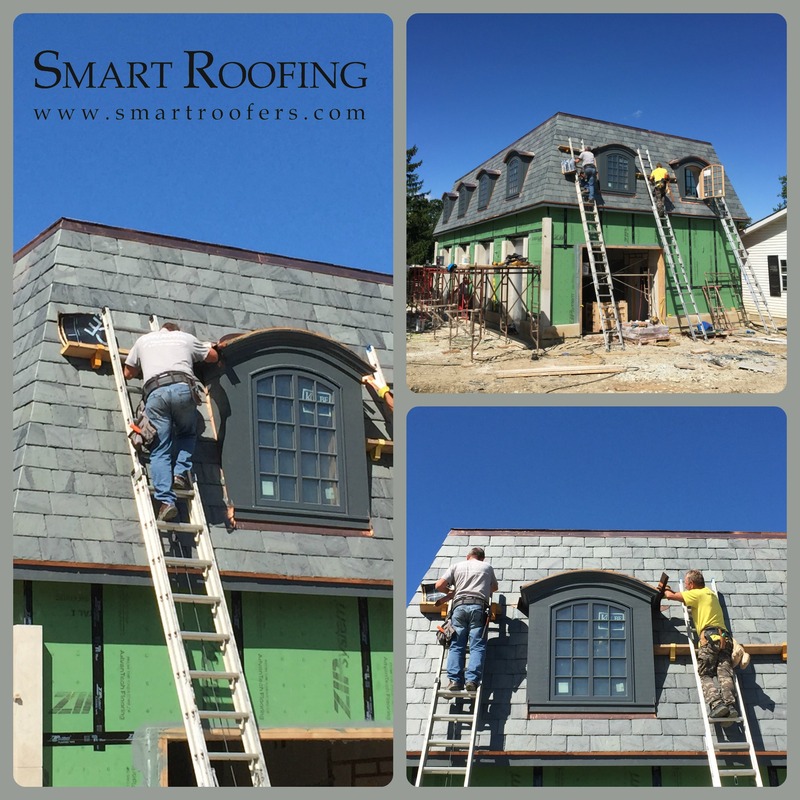 Contact SMART Roofing, Inc. today at 847.797.0404 for your slate, cedar, shingle, or tile roofing needs! During the late afternoon and early evening, multiple storms produced large hail and very heavy rainfall along the I-80 corridor, including across the far southern and southwestern Chicago metro area. The largest hail reported was over 4″ in diameter, measured at 4.75″, two miles north-northwest of Minooka around 7:20 pm. There were many reports of 2.5″ diameter hail and larger across Minooka from Emergency Management, law enforcement, and the public. There were multiple reports of vehicle damage from this area. 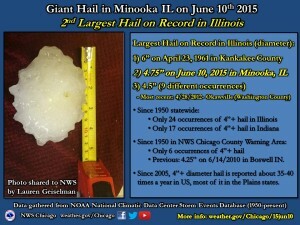 The 4.75″ diameter hail observed two miles north-northwest of Minooka was the largest documented hail stone in Illinois since at least 1961, and according to the Illinois State Climatologist, may be the largest documented hail stone on record in the state. Do you have storm or hail damage? 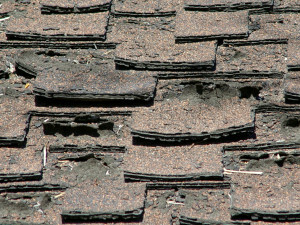 A roof may be substantially damaged by hail, even though the actual shingles appear to still be in place after the storm. Although the storms occurred last week, the damage may not cause leaking until well after the storm. This is the time that it’s crucial to have a qualified roofing expert examine your roof and fully evaluate the storm and hail damage to your property and assist you in filing an insurance claim. Even if damage to your roof may not seem severe at the moment, it may eventually lead to additional leaks and problems down the road. Contact your local roof hail damage experts at SMART Roofing, Inc. for a free inspection 847.797.0404. Contact SMART Roofing, Inc. today at 847.797.0404 for your commercial and residential roof maintenance & repair. It’s time for your roof’s spring-cleaning and inspection. Not only will this make your home look better, it can also extend the life of the roof. Here are some tips on what to look for during spring cleaning. Mold. Discolored streaks on a roof indicate there is mold, algae, or fungus, which can eat away at the roofing material and, ultimately, cause leaks. A treatment of chlorine bleach or copper sulfate solution applied with a garden sprayer can kill the mold. GAF manufactures algae-resistant shingles that have a specially formulated granule that inhibits algae growth, in addition to shingles with StainGuard® Protection. Finally, do not power wash shingles! It can dislodge granules and cause premature shingle failure. Gutter damage. 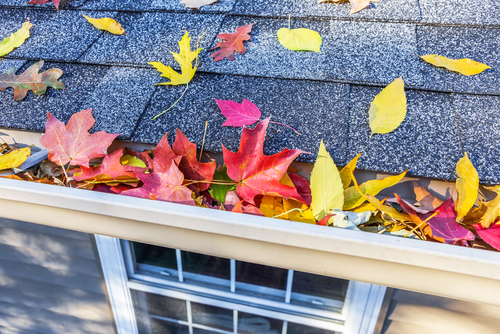 Heavy snow from the winter season can result in gutter damage while leftover fall leaves and debris can lead to clogged gutters. Check to make sure water can flow easily through the gutters and fix any loose nails that are preventing the gutters from sitting tightly along the roof line. Missing shingles, chimney, and flashing. A complete inspection by SMART Roofing, Inc. can uncover issues with missing shingles, chimney damage, or flashing around chimneys, vents, or other bends in the roof. Dealing with these potential issues in a timely manner will allow your roof to stand strong through the next season of weather challenges—and for many years to come. 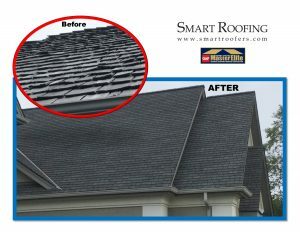 Contact SMART Roofing, Inc. today at 847.797.0404 if you suspect or find roof damage.